At $149.99, it significantly undercuts the competition in terms of price. The GoPro Hero 5 retails for $299 and the Contour+ retails for $499.99. GoPro is the market leader for a reason. It offers superior picture quality and a comprehensive line of accessories. The Contour offers advanced features, such as Wi-Fi streaming, but comes at a premium price tag. However, there is a compelling argument to be made for the Crocolis HD Action Camera. It offers more features in a more complete stock package for half the price of the GoPro hero 2 and less than 1/3rd the price of the Contour+. Let’s take a closer look at the Crocolis HD Action Camera. The Crocolis HD Action Cam is IP68 compliant, meaning it is both dust and water proof. Not water resistant, water proof. This means you can take it surfing with you in Indonesia, sand boarding in the deserts of Peru and it will withstand the tough conditions of a dirt biking in Australia. The locking mechanism, the gasket and the lens all feel very sturdy and inspire confidence. The forward facing slim rectangular profile means this is much more aerodynamic and less awkward than the flat box shape of the GoPro series. The action controls necessary while mobile are easily accessible on the top. The playback controls and the settings line the bottom of the action cam underneath the 1.5″ LCD. This is a major advantage over the GoPro Hero 5 and the Contour+ that do not come with a viewing screen. Flip open the top locking mechanism and the screen folds over to reveal all the ports and inputs. This includes the battery, SDHC slot, mic-in, mini-HDMI port, mini-USB port, TV out and the charge indicator. Whether you intend on mounting the camera to your helmet, bike handlebar, your chest or the end of your snowboard, you’re set from the moment you open the box. 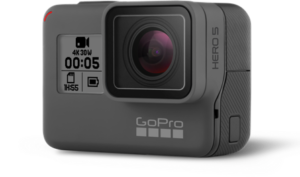 The same cannot be said of the GoPro 5 Hero and Contour+ that require expensive accessories to reach the same functionality as the Crocolis HD Action Cam. The GoPro Hero 5 and the Contour+ are excellent action cameras, but one must ask, are they worth the price? Considering the existence of extremely competitive products such as the Crocolis HD Action Camera at less than half the price, most people might be better off saving a few hundred bucks towards other equipment. If your camera doesn’t come with a waterproof case or there is not one is available for it, then I recommend you don’t take it under water. It may be OK to splash or dunk in water without case but it won’t be a good idea to keep underwater for a prolonged period of time. To make sure your camera will be OK underwater is to always use the water tight case. Another thing to look for when buying a waterproof action camera is the size of the camera and also to think about where you want to mount it. Do you want to use it on the side of your goggles? Are you going to hold it on your hand? For most people, the smaller the camera, the better so keep size in mind when you shop for one. As for mounting your camera, various cameras come with various mounts so pick the best one for your desired use. In the end, it comes down to your preference in size, mounting options, and design, but always make sure your camera really can withstand being underwater by having the option to use a separate waterproof case. Even if it costs a little extra for a good camera with a case, it will be worth it for the peace of mind.